A recent Experian Automotive credit trends study revealed that vehicle history can have a major impact on loan performance. The study found that more than 2 percent of the late-model used vehicles (model year 2005 and newer) had a negative vehicle history event (frame damage, salvage, odometer rollback, etc. ), which can significantly impact the vehicle's value. The study also showed that while these instances occur across all credit segments, more than 3 percent of financing outside of prime had negative vehicle history. Vehicles with a negative history event also referred to as "brand", also have a higher percentage of charge-offs for lending institutions. By leveraging information within vehicle history reports, lenders can identify branded vehicles when the loan is made and mitigate losses from charge-offs and from loss of value when sending repossessed vehicles to auction. To learn how AutoCheck® vehicle history reports can help identify title-branded vehicles, visit www.autocheck.com. Did a friend forward this email to you? 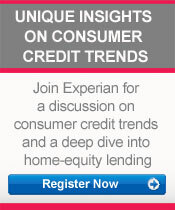 You can call us at 1 888 414 1120 or send us an email at: decisionanalytics@experian.com.